Activated Carbon is a porus form of carbon which is manufactured from various carbonaceous raw materials like Pine wood ,Coconut shell , Coal, Eucalyptus, Peat , Saw dust , Rice husk , Lignite etc. It is preapered through Carbonisation & Activation of Organic substance. During Carbonisation most of non-carbon elements, Hydrogen, Oxygen are first removed in Gaseous form & it developes the internal pores and thenafter it is Activated through Chemical Activation or Steam Activation. In Activation process , it increases the numbers & dimensions of Pores & hence it has large internal surface area. Due to well- developed pore structure and huge internal Surface Area , Activated Carbon has an excellent adsorbent capacity in both form Powder Activated Carbon and Granular Activated Carbon. There are three types of Pore Volume. 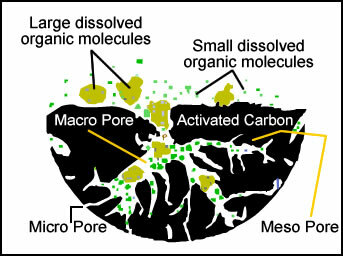 The Macro Pores are used as entrance of contaminated Molecules onto Activated Carbon, Meso Pores are used for transportation and Micro Pores are used to adsorb molecules. The diffused molecules are removed onto the Activated Carbon pores and it sticks to the internal surfaces. ( See Figure ) all molecules are not adsorbed onto the Activated Carbon surface equally. Smaller molecules will diffuse deeper onto Activated Carbon and can adsorbed more surface area than large molecules because of the size of the Pores.